– 1 will create or contribute something. – 9 will rate, edit or vote on it. – 90 will use the result. – 1 will create or contribute something. 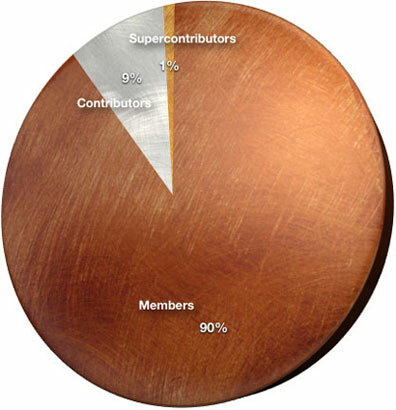 These are the ‘supercontributors’, and as is evident here, represent only 1% of the community. Keep in mind that this isn’t 1% of the population, but 1% of an identifiable crowdsourcing community, like Threadless members. – 9 will rate, edit or vote on it. These are often referred to as ‘people who contribute a little or from time to time’, or regular contributors, but Jeff Howe describes them best in his Crowdsourcing book as those who vet and fine tune the content of the supercontributors, such as the reviewers on Amazon and Yelp, the voters on American Idol, and the people who update or correct Wikipedia entries. – 90 will use the result. The rest of us, who now feel comfortable buying that book, trusting that Wikipedia entry, or dining at that restaurant, or buy that album because of the previous supercontributors and contributors. Evidence? Yahoo Groups, Wikipedia, Flickr all follow this rule by nature. This is why crowdsourced placemaking beta communities need to have at least 300 to 500 members, where 3 to 5 of them will present ideas that get 30 to 50 members excited enough to help them see it become a reality, so that the other 270 to 450 members will then become committed customers, tenants or residents of.